Just as with the chemical solutions, you shouldn’t exaggerate even with herbal ones, as they are very strong and can cause harm. Use them when the plants really need them (not just in any case or frivolously) and test on one plant first. 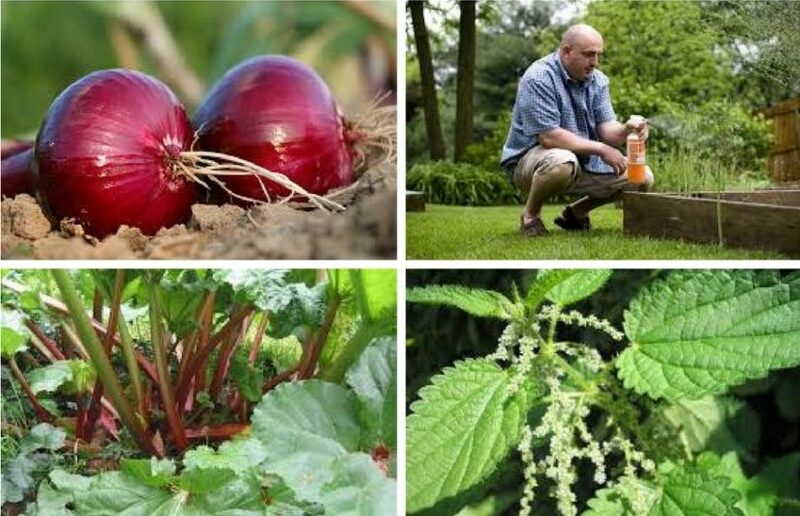 It is best to use them to strengthen the plants and prevent the diseases, in the most dangerous period (in cold or rainy weather), although some are efficient even after the disease occurs. Use them regularly every three days after every heavy rain. You can use various solutions, but it is important to use rainwater or stale water. Keep them in plastic or glass containers, not metal ones, to avoid undesired reactions. Herbal tea: pour boiling water over the herbs, leave for a while, cool and strain. Herbal brew: put herbs in water, close the container and leave in a warm place. Stir several times; when the brew stops foaming, strain and use. Herbal concentrate: crush the herbs, pour cold or warm water over (according to the recipe) just to soak. Stir for 10 to 20 minutes, strain, wring out and use. Most of the concentrates have to be diluted before use. You can keep them for a few weeks in a dark and cool place. NETTLE: Nettle brew strengthens the plants and repels lice and mites. Spray the attacked parts several times. When diluting, proportion for a spray is 1:20, and for a fertilizer 1:10. HORSETAIL: horsetail brew can be used to prevent fungal diseases and repel mites. Spray once a week in clear mornings against ash mold. The already attacked plants should be sprayed three times in three days. Preparation of brew: soak horsetail for 24 hours. Take the majority and cook for 30 minutes (do not boil it). Pour the rest of the brew in and dilute in 1:5 proportion. FERN: Fern as mulch protects against slugs and contains potassium. Spray in spring with diluted brew against lice, in summer against rusts (un-diluted) and in winter against scale insects (un-diluted). FEVERFEW: Use as mulch to protect against slugs, and boiled, as a brew (300 g for 10 l of water / 10 oz for 2.6 gal) or tea against all different insects. However, be careful, as it is harmful to children and domestic animals as well. During winter and to use in soil don’t dilute the brew; in summer dilute in 1:3 proportion for spraying on plants. WORMWOOD: Use as mulch to protect against slugs, boiled and undiluted in early spring against mites, lice and rust, and diluted (1:3) in summer against caterpillars, lice and ants. Don’t throw it on your compost. TOMATO: Soak two handfuls of crushed tomato leaves in 2 l (0.5 gal) of water for 3 hours. Use every second day against caterpillars, butterflies and flea beetles. ONION (and its relatives): Use boiled and diluted (500 g dry leaves and onions to 10 l water / 1 lb to 2.6 gal) in 1:10 proportion against molds and bacterial diseases. You can use undiluted tea as well (75 g for 10 l water / 2.6 oz to 2.6 gal). CHIVES: Chives tea removes molds from cucumbers, eggplant, pepper and tomatoes. VALERIAN: Tea from dried valerian leaves is good for the soil and the compost, strengthens plants in cold and works against fungal disease. Watering with valerian tea encourages plant germination. RHUBARB: The leaves are useful as mulch and for the compost. Rhubarb tea (1 kg for 5 l water / 2.3 lbs for 1.3 gal; boil for 10 minutes) acts as insecticide against caterpillars and lice. ELDER: Use for mulch against snails, pour boiled into vole and mole holes. You can use it as fungicide as well. CHAMOMILE: Soak crucifer and legume seeds in warm chamomile tea (30 °C / 86 °F) for 20 minutes for disinfection. Use diluted chamomile brew (1 handful chamomile flowers to 1 l (0.26 gal) water, soak for 24 hours) in 1:5 proportion to strengthen the plants and protect against molds. CALENDULA: Use boiled (1 kg to 30 l water / 2.3 lbs to 8 gal) to strengthen the plants and water them, diluted in 1:10 proportion. INDIAN CRESS: Use in green fertilization methods to disinfect the soil. It is a good neighbor for brassica crops, as it drives away butterflies, and for potatoes, as it drives away the Colorado beetles. Indian cress solutions work against leaf lice, flea beetle, caterpillars and the Colorado beetle. DANDELION: Use it boiled (2 kg of fresh dandelion to 10 l water / 4.4 lbs to 2.6 gal) or tea (200 g dried dandelion to 10 l water / 7 oz to 2.6 gal) to strengthen the plants. CARROTS: Planted as a good neighbor or prepared as tea (50 g to 1 l water / 1.8 oz to 0.26 gal) it drives away onion fly. Water regularly with undiluted tea. YARROW: Use yarrow brew against fungal diseases. Soak 20 g (0.7 oz) of dried herb in 1 l (0.26 gal) cool water for a day. Use diluted solution in 1:10 proportion. SAGE: Use tea against harmful soil fungi, but only when necessary, as it also destroys beneficial fungi. MILK: Dilute whole unpasteurized milk with water in 1:1 proportion and spray one a week against mold fungi and lice. SODA BICARBONATE: Make a solution for spraying against fungal blights, oomycetes and ash molds. Mix 1 teaspoon of soda bicarbonate with 2 teaspoons of vegetables oil, add 3.8 l (1 gal) water and a few drops of washing up detergent. SEA ALGAE: Purchase the solutions with algae and use to strengthen the plants in stressful situations. FUNGI: You can purchase solutions with beneficial fungi. They can protect against ash molds and seedlings damping off, destroy wireworms etc. but don’t harm the garden. Use as instructed for proper effect. ENTOMOPATHOGENIC NEMATODES: The solution with entomopathogenic nematodes can be purchased and used against mole crickets, wireworms and some other pests. Use as instructed and moderately.